My friend, the lovely Madame C, who is the original americaine in this tiny village (I am the barely known "other" American) called me last week with a favor to ask. She is a teacher at the elementary school and wanted to know if I would be willing to be a special guest for her English students. And while she gave me every option to decline, even saying, "You can leave after only fifteen minutes if you want to," of course I said yes. I was even tempted to respond that it would be "totes adorbes" for the first time in my life because what is not to love? Yes, I am incredibly shy in large groups...but come on, that is with adults! I couldn't wait to see what the extra small versions of my neighbors would be like and to see a French classroom. Would it differ greatly from my memories of being that age in the States? 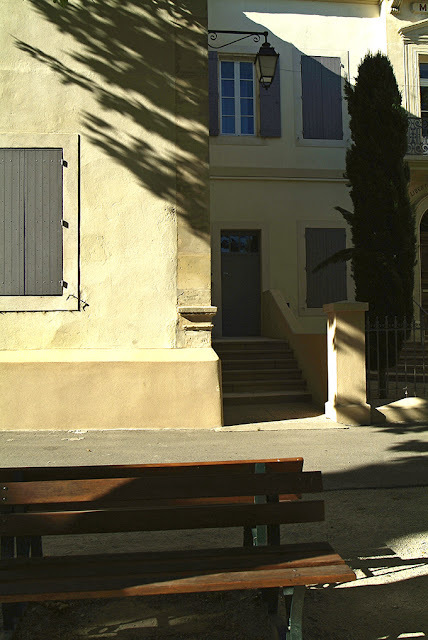 So at 3pm today, I rang the buzzer, appropriately marked "école" at a doorway on the left hand side of our mairie or town hall. I listened for a moment at the first cigales buzzing in the heat until C opened the door, clearly a bit flustered. "They aren't ready yet," she said apologizing. "Would you mind waiting out here for just a bit?" A miniature wooden chair was procured. "Pretend like you don't hear what is going on inside!" After she pulled the door behind her, I listened to a cacophony of voices bubble and burst, somehow always remaining on the proper side of pandemonium. 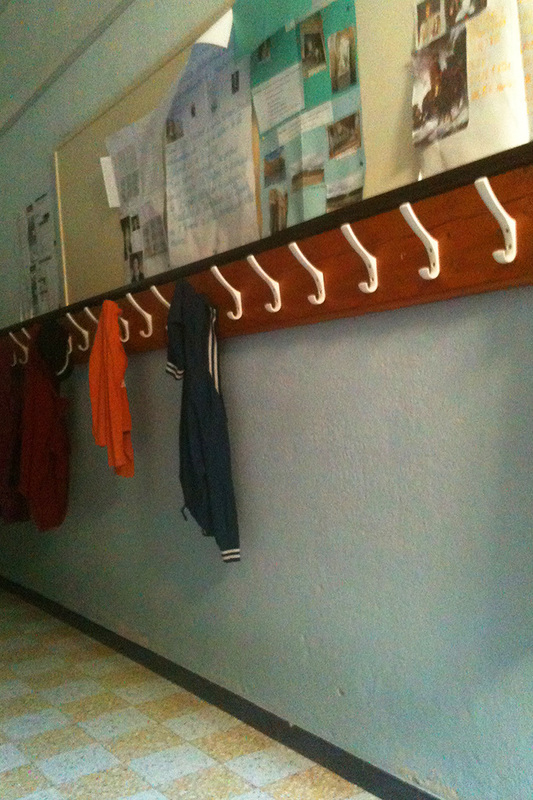 In the hallway I found the same gray blue paint that seems to be a standard school color and coat hooks placed for kid-sized reaching along a wooden rack on the wall. Giant decorated poster-boards had been tacked above them. I scanned "La Révolution Française" explained in brightly colored pencils and was just about to take a photo of Lou Reed standing in as the symbol for Oedipus (Rex) when C opened the door, eyebrows lifted as if to say, "Are you ready?" Inside, I was met by...a receiving line. Perhaps thirty children, I would say none much older than nine, were standing by their desks with a special group of ambassadors at the door. "Hello," said the first boy with confidence. "Welcome," said another. "How are you?" And so it went. Each word spoken so carefully as if they were passing along a crystal ball from one child to the next. Already, my cheeks were beginning to hurt as I was smiling so hard. "Right this way, please" said a blonde girl with freckles while giving a classic Maitre d' arm sweep. C had prepared me that our theme for the discussion would be as if I were a guest at a restaurant. I was shown to a table in front of the classroom. "Won't you sit down?" piped in another. I was quite impressed. Plates and cups were passed out and C announced that we were going to take une petite pause in order to celebrate a few of the students upcoming birthdays. Aha! No wonder the children were nearly levitating with excitement! "Would you like a cookie?" I accepted, smiling inwardly at the staccato pronunciation of such an oh-so American word. Three girls lined up in front of the cakes lit with bougies and sparklers while the rest of the class sang first "Happy Birthday" and then a version "en espagnol!" and finally "en français!" No one laughed when the smallest didn't quite successfully blow out her share of the candles. I actually didn't sense meanness of any kind in the class, just the usual "end of the school year" rambunctiousness. As I accepted cake, then brioche, I finally had to politely decline the various gummy bears on offer for fear that all of this sugar would make my head explode. The questions resumed amidst munching as each student - always shyly, often nervously - approached me with their prepared question. "Do you like carrots?" I do and had some for lunch today. "Do you like donuts?" No, not really (which was not at all the response that had been expected and so was met with a fit of giggles). After everyone had successfully delivered their prepared question (at times with repeated coaching whispered in their ears by C), the language was turned and the students were allowed to ask me questions...in French. Not having children of my own or having had much experience with them, I always appreciate a chance to get an unfiltered version of their personalities. And the questions were appropriately direct, my favorite being..."Are you old?" Yes, yep, I am. Because in their eyes, I am ancient - as huge as a monster, as tall as a skyscraper! Speaking of, I think what they were most interested in was when I explained that in Manhattan, as it is so crowded, people don't live in houses (this was met with a "non!") but apartment buildings that can be fifty or even one hundred floors high. I think that will be a subject around the dinner table tonight in our tiny village. With class nearing to an end, I was met with a united chorus of "Thank you" then "Have a nice day" and even a formal "Good-bye." C walked me out. She seemed relieved and proud that her students had down so well. "We are so old!" - I couldn't help but blurt it out - "And they are so young...wow, do you remember what it was like to have all the world, all of that knowledge in front of you?" "I see it everyday," she replied with an assured smile. "How wonderful that must be," I thought as I left the school behind and found my way home. Such FUN! How wonderful to spend an afternoon with a joyful bunch of kids. I love spending time with kids, too...since I don't have my own, I love everyone else's! I started reading this with a huge smile on my face -- my cheeks hurt just as yours did! But by the end, there were sentimental tears in my eyes. I really miss having kids in my life and it reminded me of meeting my son's "little sister" in Morocco -- the 10-year-old daughter of his host family. She greeted me with such loving hugs, kisses, and lots of respect. Thank you so much for sharing what must have been a gift of a day. Thank you for a gift of a response! I enjoyed every minute of this post! Thank you so much for sharing this wonderful experience! You are welcome. :) I wish that I could have taken photos!! What a fun afternoon. Kids are amazing, they always ask such direct questions and catch you off guard! Your friend sounds like a wonderful teacher, we need more like her in the world. Hope you've recovered from your sugar high! I only picked at my cakes and C had me bring the cookie home! And yes, she seems like a great teacher. You can tell that the kids love her. Great writing. I felt like I was right there! I use to do a little talk to elementary students about my experiences of living on The Netherlands. I took slides, photos, posters from KLM, tulips and windmill shaped cookies. In their thank you notes...the good cookies were always mentioned. I love kids. Heeheehee. I love that you did that Janey! Lovely! Sounds like a super afternoon in a small town. Bet you get a lot of hellos, or bonjours, from these kids when you see them in the future on the streets or in the shops. Wow! Congratulations on your new celebrity! Your unique experience sounds like oodles of fun that will last forever. Oh you know kids, you are important one minute then forgotten the next! Heather you will now be very well known in your village and yes, discussion about the dinner table on the conversation with the kids. How great! Stop!! You went to an elementary school and didn't tell me?? I'm on cuteness overload - was dying for pictures but I don't know if I could have standed it. How adorable - the restaurant scene, the polite questions ("do you like carrots?") and not-so-polite questions ("are you old?"). What a wonderful thing - for them and for you! Also your post reminds me how lucky I am that I get to see those little faces discovering the joy of music every day - that is not a bad thing! And you are SO amazing at what you do Sister. I am so crazy proud of you!!! I saw some of your past Post's, love the Garden and all the photo's. What fun to sit in a French class, enjoy. Heather, my brother and sister in law did the same thing a few years ago in Fontvielle. Unfortunately, my brother is a bit of a character and soon after arriving had the kids bouncing off the walls. I pitied the poor teacher. In fact I don't believe they have been invited back to school. I trust you did a much better job. Sounds like a good day. Your story totally made me giggle. Yep, I tried to keep talking with them on the "down low" - they were worked up enough about the cake already! This was so FUN for you and even for us your readers!!! I'm thrilled you have another AMERICAN friend in your village!! I think that you need to kidnap him, Elizabeth!! "remember what it was like to have all the world,"
You have the thoughts of the children. We are not old. To a child, to be young,a moment is the future. Me, too.I will cherish that experience.I might lose my way home. This is really sweet Heather! Oh my: elementary school does seem so many, many years ago. And yes, life was all ahead of us. And I love your first picture with such wonderful shadows! Thanks for the lovely story! Libby, it seems like it couldn't have possibly have been in this lifetime...and yet of course it was! It was really sweet to see all of the drawings on the walls, the little desks, all of it! That sounded like fun. You truly captured the mood of the classroom. I am sure that your visit was one of the year's highlights for the children. How lovely! I really enjoyed reading your post of the school visit and the happy impact that those children had on you. I'm sure you will now become a local celebrity! You'll get smiles and waves as you pass! We'll see. One of them wanted to know where I lived - heehee!! How wonderful you had a chance to do that for those children. I am sure you were the center of conversations around dinner tables that evening. lovely indeed and their teachers should be good exemples for them. opportunities to meet people with interesting adventures like yours. On the other hand they could really give you a so exciting and unique experience of life. Believe me it would be great! It is a challange every single day and the more you give them the more they give to you. Have a nice evening my dear! It was so wonderful to hear from you about this, Emilia. I especially loved what you said about the more you give them, the more they give you...I bet that is so very true! I teach high school and I'm constantly aware of how the future stretches out before these students in lovely, unknown curves. When I invigilate exams and have time to just sit and think, I ask the students, in my head, "do you know how beautiful you all are?" I bet they don't, Lorrie! But how important that you are there to help them see glimpses of that beauty. And of those possible curves. I am so grateful to have so many teachers reading here as I have nothing but the highest respect for this amazingly important profession. One of the joys of being a school district communications director were the classroom visits - I often found myself reading books or judging contests or any number of activities with these young inquisitive souls. Like you, and not having children of my own, I found them to be such a delightful collection of future possibilities! Great post, Heather. Wow, I love that there are so many people that either are or have been involved in education reading along Jackie - I had no idea and I am very flattered! Hello Heather! Oh, I just love, love, love this story. What a fantastic opportunity to spend some time with your young neighbors and see the world through their eyes. I'm sure you and they will remember this for years to come. It reminds me of the importance of taking the time now and then to respond to our world through the perspective of a child - all wonder, honesty and joy. Thinking about you in front of them makes me happy. I feel the same way too Jeanne - look at my mentioning you in my new post just while you were typing this! How I wish we were able to get together every once in a while...and yes, Heidi would be invited too (ps. I can't get over Paloma on her ig thread - the way she stands/poses - she is going to be a model!). But I am really grateful that at least we saw each other in person that one afternoon just as a...confirmation...that, "Yep, I know her and I like her, not just as a virtual friend"! And I am beyond thrilled that you are buried in work. You took a risk and oh how it is paying off...I will keep saying that and can't wait to watch you flying higher and higher! A highlight for the children.....and you.